Before the arrival of the railway in 1854, there were very few people living in the area that is now Tilbury Town. Following the arrival of the railway, a few railway workers settled in the area. But it was the building of the docks, completed in 1886, that gave birth to the modern town. The housing for dockers included the Dwellings. In 1912, the growth of the community was recognised by the establishment of Tilbury as an urban district. The newly established council began a programme of house building that continued into the 1920s, although it was delayed by the 1st World War. The town suffered during the depression of 1930s. The Tilbury Distress Committee reported at Christmas 1931 that 900 families were on the verge of starvation. An emergency soup kitchen was established on Calcutta Road. 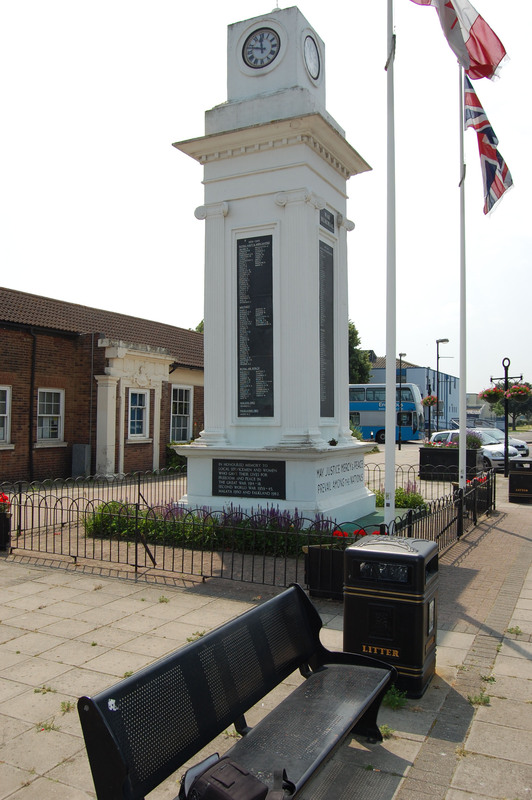 In 1936, the Tilbury Urban District Council was merged with other local authorities to form the Thurrock Urban District. Tilbury was an important target for German bombing during the 2nd World War. Many houses were lost as was the Tilbury Hotel. Tilbury Town station was hit by a V2 rocket. However, Tilbury played a major part in D-day, both as a embarkation point and also in the construction of the PLUTO pipeline and the Mulberry harbours. In 1953, a tidal surge resulted in extensive flooding on either side of the North Sea. 2,500 homes in Tilbury were flooded, and 1,300 people were evacuated. The west block of the Dwellings was demolished in 1961 – the east block had gone during the war. Tilbury B power station started generating electricity in 1965. Further research reveals that the V2 actually struck the railway sidings to the east of Tilbury Riverside station – further down the line. A full description of the incident can be found on page 146 of ‘Thurrock Goes to War’ (R.Rogers & J. Catton) 1997. “Dec. 04, (02.32 hours) – Battery 444, Scheveningen (Site 96), V-2 rocket fired, impacted railway sidings at Tilbury, Essex. Direct hit on railway carriage. 11 Carriages destroyed, 10 other trains moderately damaged. 5 Sets of rail tracks put out of commission. 6 Persons seriously injured.” So, apparently not the station itself, but sidings and carriages. i question the statement that Tilbury Town station was hit by a V2 rocket. I travelled from Tilbury to Fenchurch St. from July 1944 to the end of the war and I can’t recall the event. I was the Editor’s boy on the ‘Star’ (evening newspaper) and we got 2/- for being first with a bomb story – and I certainly would have claimed that one! Hi, If anyone remembers the queen visiting Tilbury during the floods of 1953 please could you contact me. I am a researcher at the BBC and we are making a film for the Diamond Jubilee and would be interested in talking to you - janebrooks52@talk21.com. Thank you.